The upside price moves recently in the US Equities markets have been dramatic. While many people believe the US Equity markets are overvalued and setting up for a top, we believe just the opposite – that the US Equity market and strong US Dollar are attracting capital and investment from numerous internal and external sources. We also believe the Q2 2018 earnings season, which is just about to begin, could be an additional driving force for further price advances – with big upside moves ahead. Strong US Dollar and global trade/policy issues: these are driving concerns and economic sustainability issues in many foreign nations and attracting investments as the US Dollar continues to strengthen against many foreign currencies. Foreign Debt/Economic Sustainability issues: the facts that economic cycles, as well as political and social concerns, have roiled many foreign markets, elections and policies in combination with somewhat out of control debt levels in some countries is starting to weigh on investors. Yes, strategic investors will still be looking for opportunities, but longer-term investors are seeking risks everywhere and are searching for protected investments – not risky deflationary investments. Leadership Changes/Challenges: as we have all recently seen, there are a number of political leadership and regional economic and policy challenges that are underway at the moment. Italy, Greece, Malaysia, Mexico, Denmark, Belgium and a host of others are all in the process of restructuring policies, objectives and SOP (standard operating procedures) to address new demands from their people and the world. What was acceptable, nearly 24+ months ago, is now just not the case any longer. The result is that leadership must adapt to the new demands of the people and economic environment. Simply put, there is so much going on throughout the rest of the world in terms of currency valuations, global trade and policy issues, debt levels and economic sustainability concerns as well as leadership concerns and dramatically changing political and economic environments that investors are actively seeking some level of “standard of protection” for their capital.. And the only places on the planet, right now, that offer that standard are the US, Canada, and Great Britain. Our opinion is that, soon enough, the only economies on the planet that will be capable of handling the ROI and capital requirements of the world will be the most mature and dynamic economies on the planet. – Technology will likely continue to shine with earnings growth and increased subscriber bases. Netflix, Hulu, Microsoft, Amazon and a host of other will likely surprise with earnings over the next few weeks. – Industrial standards like Disney, Comcast, Charter Communications, Sony, Marvel and many others will likely support strong earnings and forward guidance. – Manufacturing and Chemicals will likely be positive to mixed overall. Some companies will likely issue strong forward guidance while others may issue weaker guidance as a result of foreign market slowdowns. – Biotech and healthcare will likely produce strong results overall as the past quarter has likely been a “lean operational process” for many not knowing what to expect throughout the next 12+ months. – Weakness may be seen in some isolated instances with companies that may be more exposed to global demand and raw material costs (oil, copper, hard materials). Yet we believe the outcome of this Q2 earnings season will be moderately strong overall. 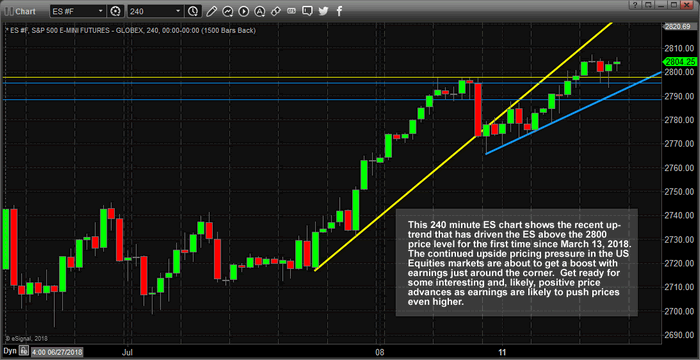 This 240 Minute ES chart shows the recent upside price action as well as the recent breakout to new highs (above 2800 for the first time since March 2018). These upside price channels are likely to hold going forward and we expect earnings to drive prices to near or above 2900 (new all-timehighs) relatively quickly in the ES. As we have been highlighting, we believe the ES and YM have the strongest potential for upside price moves compared to the NQ. This Daily SPY chart clearly shows the rotational lows followed by upside price advances that are indicative of the recent price swings. These deep rotational lows continue to setup “higher low” price levels that allow technicians to understand price pivot formations. Each of these rotations sets up an opportunity for skilled traders to jump into the next upside move for profits. The recent breakout of new highs indicates we could be in for a dramatic move to well above $290 throughout the earnings season. 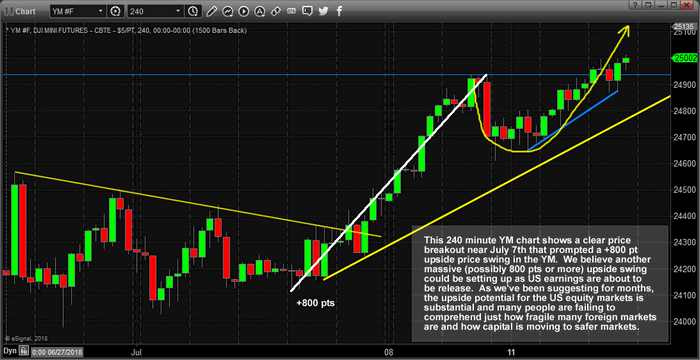 Lastly, this 240 Minute YM chart helps to illustrate the upside potential of the DOW & Transports Index. The last upside swing in price from July 7th till July 11th totaled about 800 points. If that move replicates with this new upside swing, we could see another +800 point move higher from recent lows near 24,500. This would indicate an upside potential to near 25,300 or higher. Make sure you are positioned for these moves through this next earnings season. 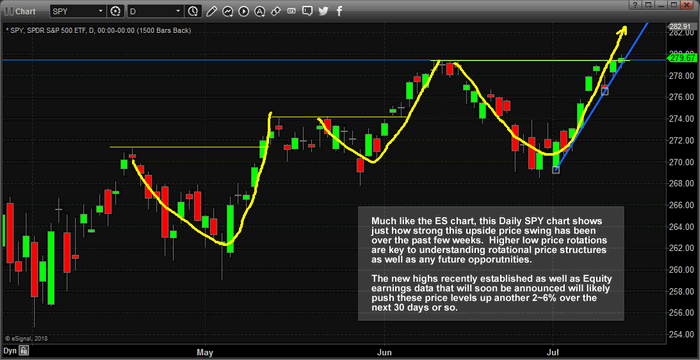 If our estimates are correct, we should see some fantastic trading opportunities over the next 30+ days. Visit www.TheTechnicalTraders.com to learn how we can assist you in capturing greater profits and greater success with our advanced research and market reporting, Daily market videos, detailed trading signals and more. Join the hundreds of other traders that follow our research every day to create greater successes.